We, the Guest Editors, would like to thank Paul Whitmore, who was spiritus movens for this special issue and for creation of NOAA meteotsunami funding opportunity, which leaded to the realization of the TMEWS project. He also reviewed the Editorial and his comments improved the quality of the text. The TMEWS (Towards a meteotsunami warning system along the US coastline, http://jadran.izor.hr/tmews) project was funded by NOAA, Award No. NA11NWS4670005. 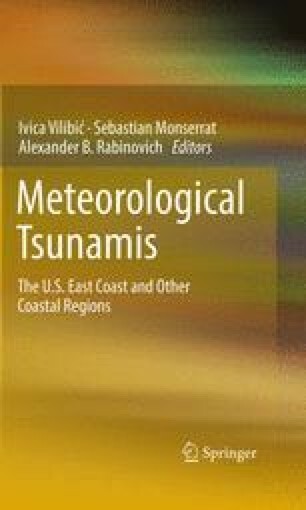 Tad Murty, the Editor-in-Chief of Natural Hazards, and Petra van Steenbergen, Senior Publishing Editor, Earth Sciences and Geography, Springer, are acknowledged for arranging and encouraging us to organize this topical issue on meteotsunami. We also thank Bhavani Sridhar at Journals Editorial Office of Springer for her editorial assistance. We especially would like to acknowledge Fred Stephenson who reviewed, edited and polished many papers in this issue. Finally, we would like to thank all the authors and reviewers who contributed to this topical issue. Work on this issue by Ivica Vilibić is supported by Ministry of Science, Education and Sports of the Republic of Croatia and by Alexander B. Rabinovich is partly supported by RFBR Grants 12-05-00733-a and 12-05-00757-a.